Qty (1) = One U-bolt, (2) Stainless Steel Flat Washers and (2) Stainless Steel Nyon Lock-Nuts. These u-bolts are perfect for 3" x 3" crossmembers and axles. Use these and you'll spend less time fixing and more time boating! 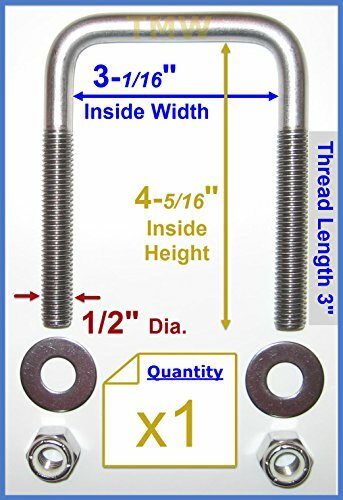 These 304 stainless bolts prevent rust corrosion, have 3" inches of threading, and 13 threads per inch. Look for our other listings for multiple quantities in order to save on shipping. If you have any questions about this product by TMW, contact us by completing and submitting the form below. If you are looking for a specif part number, please include it with your message.